Handcrafted from beautiful wood varieties, Ken Klein’s furniture designs are awe-inspiring all on their own. 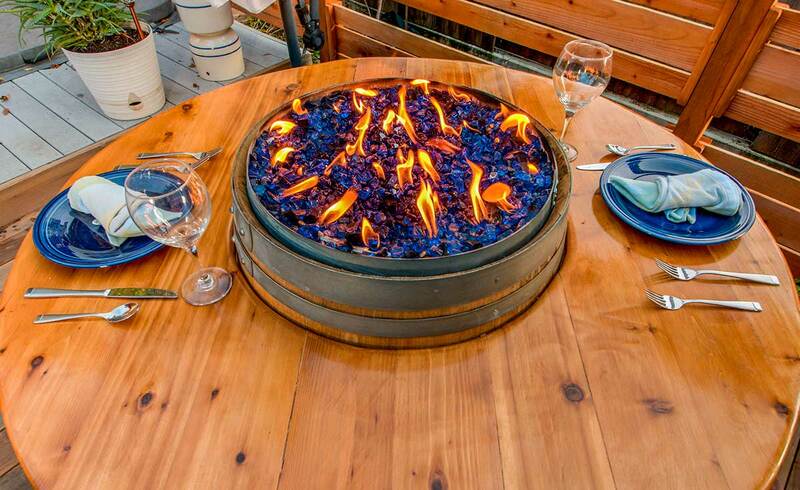 But what happens when you add fire pit glass by Celestial Fire Glass? 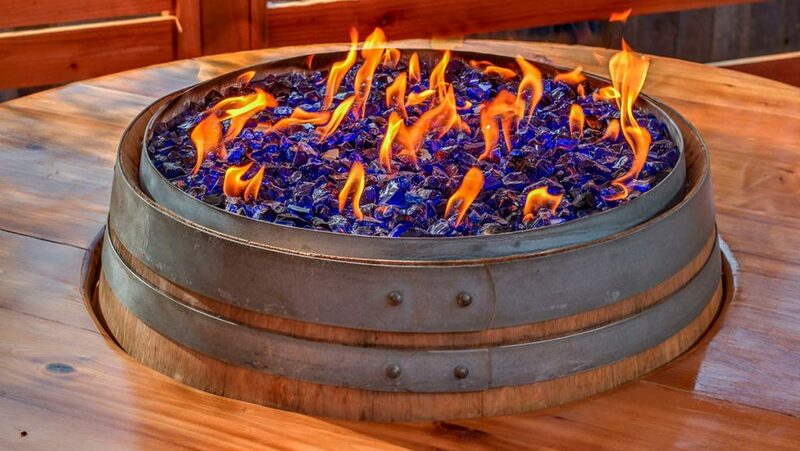 Take a look at how our Cobalt Blue Crushed Fire Glass lends a brilliant pop of color to this gorgeous propane fire pit ensemble, in the photos below. The cool blue of the glass provides a wonderful contrast to the warm, earthy tones of the wood. What’s more, the gravel-like texture of the crushed glass is the perfect complement to the natural wood grain and the rustic look of the wine barrel. Toss in some blue tableware and you’ve got a showstopper of a backyard dining set! Imagine topping this table with delicious food and gathering around it with your favorite people on a fall or summer evening. Picture the light from the golden flames dancing across your glass and silverware as the fire warms the air. Heaven! 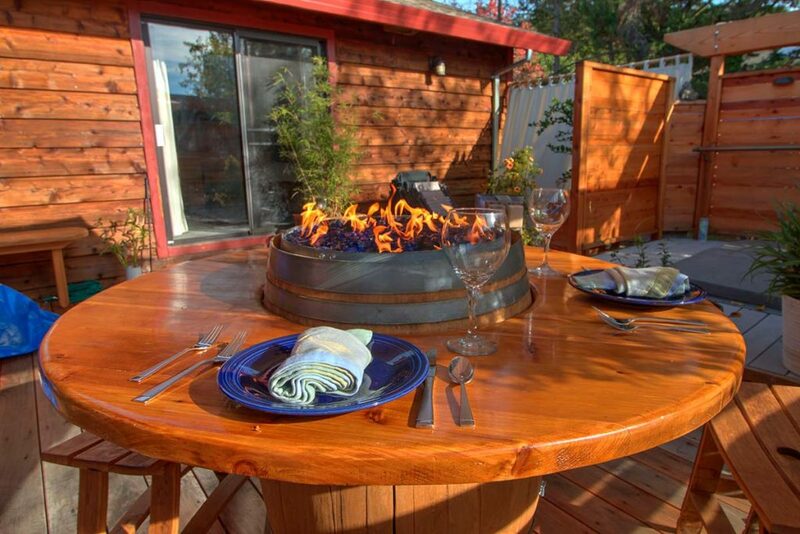 Crushed firepit glass is an easy and inexpensive way to add color and shimmer to a new or existing fire pit. It’s crushed instead of shattered, resulting in small pieces shaped like small rocks. The jagged edges create extra space in between the pieces. This space leads to higher flames that deliver unmatched beauty and drama to your fire feature. 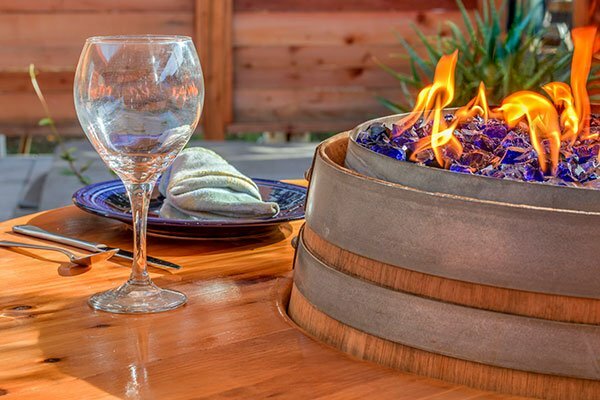 Rich, textured color: The gravel-like appearance of crushed fire glass adds a coarse, varied look to your fire pit or fireplace, and provides unstoppable shimmer when the flames are ablaze. It lasts and lasts: Made from high-quality glass, crushed fire glass is specially engineered to hold up under extreme heat. Unlike wood, the glass doesn’t burn down — nor will it crack, melt, or fade. No fumes: Worried about funny smells and potentially toxic smoke tainting the air your family breathes? You can breathe easy with crushed fire glass — it produces no chemical vapors or irritating smells. 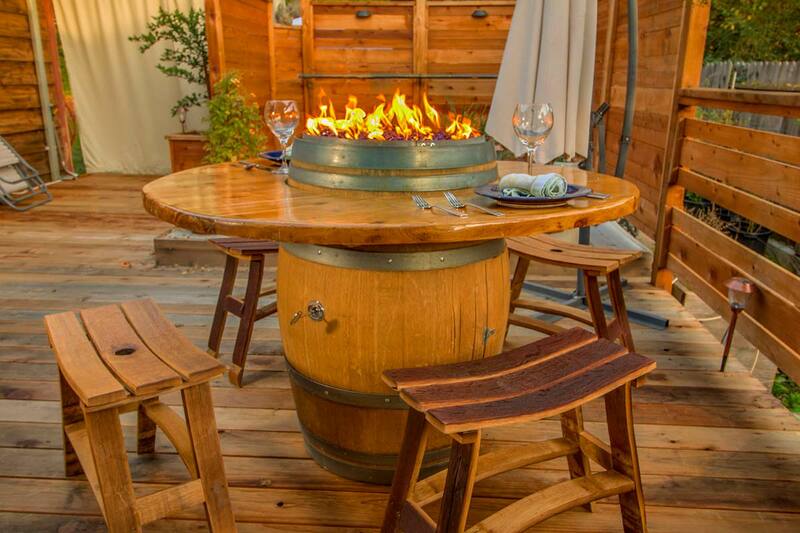 Based in Healdsburg, California, Ken Klein had been a building contractor for 30 years. During that period, customers often commissioned him to design and build handcrafted furniture. Realizing how much he enjoyed custom furniture making — and how much his work delighted his customers — Ken chose to focus his career on his true passion.